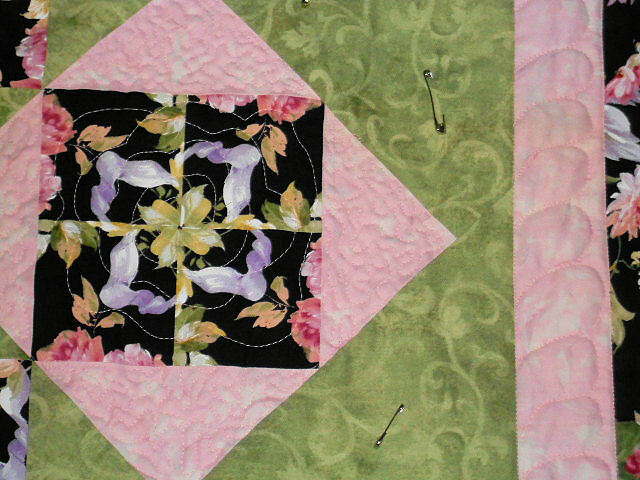 Nothing on the design wall today but this is quilt is spread on the table since I’m quilting on it. Full quilt is in pictured in the previous post. I’m one block shy of having half the blocks that are surrounded by pink quilted. The pink triangles are meandered and the floral wreaths have a large freemotion flower in them. The pink border has half feathers. Haven’t decided what I’ll do in the green blocks yet. There’s been a few emails with questions regarding CTS – which stands for ChristmasTown Sampler – A Collaboration Among Friends BOm which starts next month. When will you get the patterns for the border blocks. You will get one of them every month right along with all the other patterns you get each month. Remember it’s also a blog hop so EACH month you will go to ALL FOUR of our blogs to collect that month’s pattern that EACH of us had designed. We hope you’ll join us — it’s going to be a fun quilt!